Whilst fairly small on the scale of mountain ranges, Snowdonia packs a lot into its size. In part due to its history, whereby the ground was folded upwards many hundreds of thousands of years ago to give a massive upland region. The subsequent ice age and glacial erosion have given the area much of its shape and with it some of the best scrambling in the UK. Certainly some of the easiest to access scrambles. For those who are unsure of what scrambling is it is a kind of merging of hill/mountain walking and basic climbing. In that scrambling pretty much requires the use of your hands to move over rock sections. It also often requires you to have a head for heights. Unlike rock climbing, the idea is to move quickly through mountainous terrain. This means that a day out scrambling should feel more like an exciting and adventurous journey rather than be scaling an isolated cliff. As such you usually top out on a mountain or ridgeline. 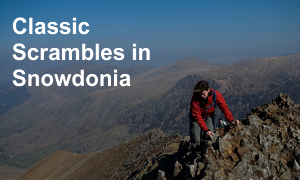 There are two main areas for scrambling in Snowdonia with many outlying areas. These two areas are the Snowdon massif and The Glyder’s and the Ogwen Valley. With the highest concentration of scrambles being found in the East Face of Tryfan and cliffs of Gylder Fach. Snowdon has many scrambles on several different peaks that make up the group of mountains in the massif. The most popular are amongst the following. Whilst this is barely a grade one scramble, it is a great introducing to both scrambling and the concept of making a journey through the mountains. It is way further than it looks and can be combined with starting up Y Cribau from Glas Llyn, which is a classic grade 1 scramble in its own right. The ridgeline is broad but on one side is a 2000ft/400m high cliff, which makes it exposed but never truly life-threatening. This is the most famous of scrambles in Snowdonia, if not the UK. It has a well-deserved reputation for being a serious outing. Due to the knife-edge ridge that makes up the main event. A fall on way means definite death, whilst the other gives a 50-50 chance of survival, albeit with life-altering injuries. Make no mistake it is a serious undertaking but if you are well prepared and above all experienced then this is the most rewarding scramble in North Wales. As a result, you need to make sure the weather is with you when it comes to traversing this ridge, as strong winds or wet rock really do not help. You can add in the North Ridge of Crib Coch and most people carry on over Crib Y Drysgl the natural continuation and onto the summit of Snowdon. 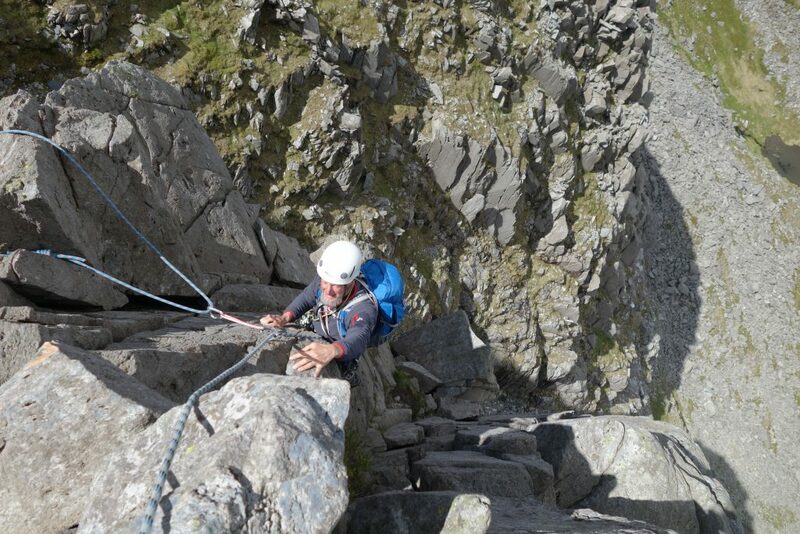 People making good time often do what is considered the full horseshoe by descending down Lliwedd. This is possibly one of the best full mountain journeys in the UK. This stunning line is a really good introduction to harder scrambling and should really be done by expert scramblers, and then with the use of a rope. As such it is a great route to be guided up, as acquiring the rope skills to move efficiently up such a vertical and intimidating nose of rock takes years of experience. 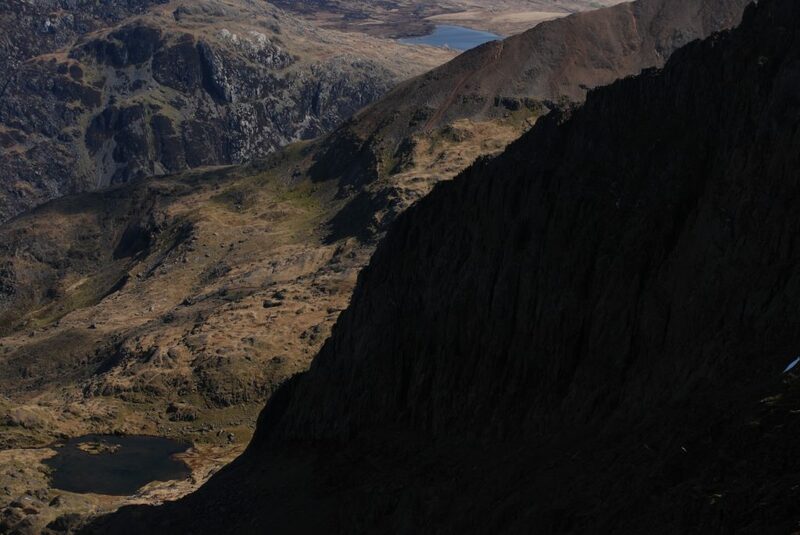 Hiring a guide for the day on this route will mean you get to experience a true mountaineering route and then top out to either head onto the summit of Snowdon or better still effectively reverse Crib Coch and the north ridge to return to your car. The steep-sided Tryfan rears up out of the Ogwen Valley like a giant monolith. 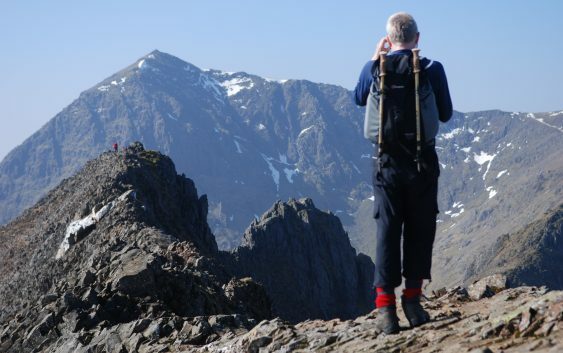 It is home to many classic routes of all grades and whilst the North ridge is its best known there are still hidden adventures to be had that avoid the crowds. The summit is marked by the famous Adam and Eve blocks which can be seen from the valley along with the canon on the North ridge, jumping from Adam to Eve is meant to give you the freedom of the mountains for a day. This is the most popular grade one ridge in Snowdon, as whilst it has some technical and demanding scrambling, much of the hardest stuff is actually avoidable. That said even avoid the hard stuff the route is still a grade 1 scramble. Unlike many scrambles, it starts pretty much from the roadside and within 10 minutes you are using your hands. Along the way you can take in the canon, a classic rock perched out on the skyline and take a photo in the right place and it appears you are stood above the void. There are also some fantastic quartz nodules along the way and the imposing North Tower. This is technically the crux, and if you don’t fancy it you can skirt round to the left and make your way into the gully beyond it and regain the ridge. If you choose to tackle the North Ridge, then the route finding is the hardest thing and an experienced guide will know the way that is both easy and not too exposed. There are moments when falling is not an option, however, these tend to be the easy parts. Again if you break this down and take it easy then it is an exhilarating part of the route. The summit is an isolated rock plateau with the Adam and Eve blocks. Most people continue off down the South Ridge without much-added drama.However, if you want a bit of an adventure then a local guide can take you off down Little and North Gullies. This hidden gem is another grade 1 scramble that heads down the really steep East Face. It is really hard to follow if you have not been up it as the line is devious. We could have suggested any of the scrambles on the East Face, as they are all classics, good rock and interesting route finding makes them real adventures. Again they are no places for beginners and employing a local guide will mean you can get guided up them quickly, efficiently and safely. You might also be able to squeeze a second route in on Glyder Fach if you are moving quickly enough. The North Buttress is much more like a rock climb in it lower 80m, but can be quickly past in a four short roped pitches and then becomes much more amenable. You can follow a line right to the summit, effectively walking onto the summit between Adam and Eve. The Upper Cliff of Glyder Fach is home to a few more scrambles, as with all high north facing cliffs some of the rock is prone to freeze-thaw over the winter months and care is needed. The rock is mossier than other places and as such should be avoided in the damp. Whilst technically only grade one scrambling, I feel that the loose nature of some of the rock as you exiting the steep start means that you need a grade 2 head on your shoulders to deal with it. That and a helmet should you be scrambling below people. Higher up when you get to the Bristly bit of the ridge the rock is much better and the pillars of rock that block your way that force you to cross them are spectacular. It can make a fitting end to a scramble over Tryfan and get you to the summit of Glyder Fach to enjoy the Cantilever Stone, a giant table that appears to be balanced on a knife-edge. Again the best way down is to complete the Bochlliwedd Horseshoe by descending Y Gribin. This route is one of the toughest in North Wales, the crux pitch is definitely more of a rock climb than a scramble but it is only 40ft long and well protected, the rest of the route can be climbed relatively easily. Although the approach pitches need care with loose rock again. The Dolmen, is a perched block that looks like a burial chamber or Dolmen. It gives the route its name and allows you to lead onto the summit of Glyder Fach via a narrow ridge that picks a fine line up the rather chaotic North Face. As I have mentioned there are many really great and popular routes in Snowdonia. Above I have just listed those in the two major areas, but there are more in the Carneadau, Mynydd Mawr, Moelwyns and Cader Idris to name a few. Often it is a case of choosing the right routes for the conditions. As such hiring a local guide to take you on your desired scramble will add a degree of safety to your day. In that, you will save time in route finding and on the hard scrambles have them manage the complex rope work. 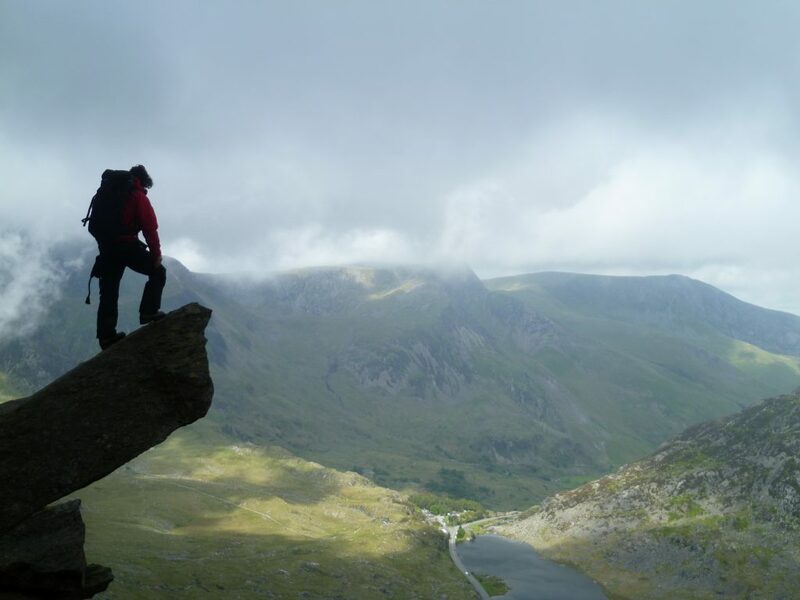 If you would like to find out more about guiding services then visit Snowdonia Mountain Guides.